Pre-heat the oven to 180°C. Quarter the bell peppers, remove the core. Peel and halve the garlic cloves. 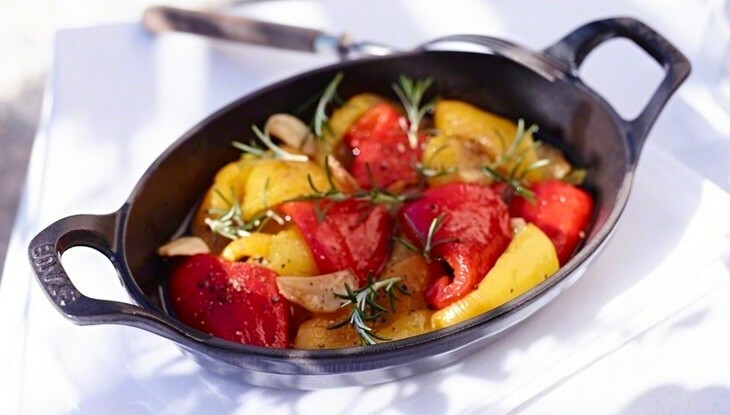 Mix the bell pepper quarters with the garlic and olive oil in a bowl, then distribute with the oil in a STAUB cocotte and simmer in the oven for about 30 minutes. Let the soft, braised bell peppers cool and then peel off the skins. Return the peeled bell peppers into the simmered oil in the cocotte, mix in the freshly picked rosemary and season with salt and pepper.